If you’ve come to Paris to experience the French’s l’art de Vivre, make sure to plan a visit to the Angelina Tea House along rue de Rivoli. The Angelina Tearoom is a masterpiece of elegance and sophistication. Its distinctive Belle Epoque design was the product of world-renowned architect Edouard-Jean Niermans whose other notable works include the Moulin Rouge and the Theatre des Capucines. The air of luxury and splendor hits you as soon as you step foot inside. However, it’s not just the ambiance that sparks your feeling of opulence. The menu is equally magnificent. Most people visit the Angelina Tea House for the decadent hot chocolate “l’Africain” and the unparalleled Mon-Blanc pastry. But there’s plenty more in their menu to consider. They offer fantastically French dishes perfect for any time of the day. For breakfast, try the omelet with summer truffle breakings and lettuce heart. For lunch, you can’t go wrong with the smoked salmon salad that’s served with fresh goat cheese, avocado, tomatoes, grapefruit, and romaine lettuce. For dinner, go for the sea bass fillet served with julienned vegetables. No matter how scrumptious the meals, though, the Angelina Tearoom will always be revered for their dessert fare. Apart from the Mont-Blanc, you can enjoy some delectable macarons and a wide variety of tarts and pastries. 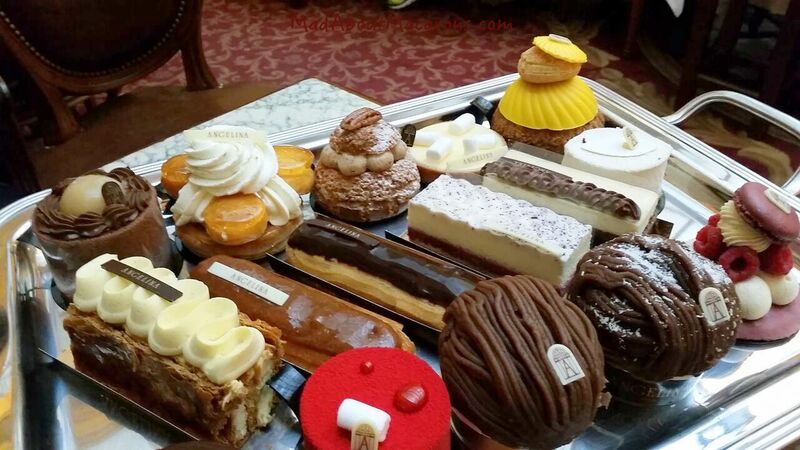 You can even head onto the delicatessen to purchase these beautiful pastries to enjoy later. The Angelina Tearoom gets full, and while long queues typically move quickly, it pays to make a reservation. Thankfully, it’s easy to make a reservation on their website.